Features: Long earrings are a must-have item right now. If you do not have pierced ears, no worries. Here is a lovely choice for you. 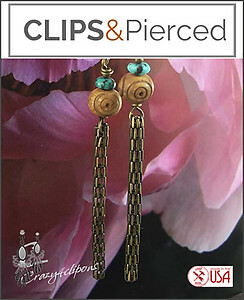 Simple, these long drop clip on earrings are made of meshed chained tube, wood beads, topped with a turquoise rondelle. They are a must to versatility to your style and it will extend into seasons ahead.